Diving Phi Phi Islands – Palong Wall, aka Coral Garden is found on the North West side of Phi Phi Leh and the name literally speaks for its self. The soft corals here are very impressive. Along the wall of this relatively shallow dive site are some of the most beautiful colours of coral that can be seen in all of Thailand. Recommended Phi Phi Dive site! The corals are an attraction for many small and exotic creatures, the Tiger Tail Seahorse and Ornate Ghost Pipefish can be found hiding, with a little time and patience of course. Everyone can enjoy the tremendous array of colours and beauty of this stunning dive site, it is not deep and the maximum depth at high tide is 18 meters. There are some small sandy areas at the start of the dive, although this is a little deeper than 8 meters. Many Dive masters and instructors favour this dive site and is a very popular second dive site after Bida Nok or Bida Nai have been dived in the morning. Lunch in Maya Bay and then a relaxing hour in the late morning sun or maybe a gentle snorkel before heading into this is a great dive site. After entering the water the diver drops down to a steady 12 meters, the visibility is clearly one of the best in the area, and there is usually very little current here. Keeping the wall on the right hand side, the diver can swim out towards some verge boulders where Giant Moray Eels and Blue Spotted Stingrays can be spotted. Just recently a Moray was spotted in a scuffle with a Coral banded Sea Snake, the image was captured on video, showing the poor Sea Snake make a high tail out of there and with a flea in its ear. After the large boulders have been explored, a smooth turn back into the wall and some stunning scenery will be observed. 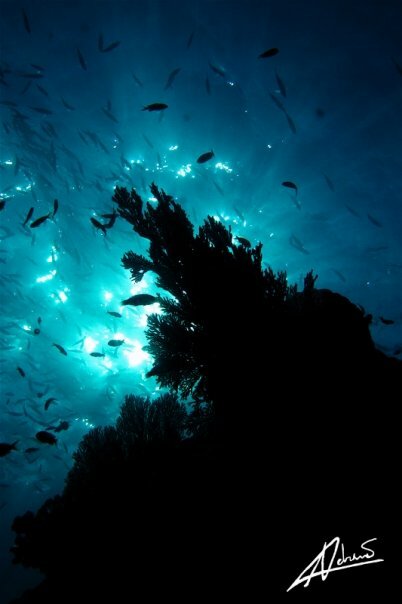 Little swim through covered in reds pinks and purple soft corals all surrounded by little glass fish, trying to keep out of the reach of the ravenous clutches of the small Trevally and Silver Mackerel. There is also a large amount of Angel fish here, with breeding pairs of Blue ringed and Emperors flourishing on this site. Juveniles, make for great photos with their beautiful swirling colourations. Marine fish: Great Barracuda, Blue Fin Trevallies Blue Ringed Angel Fish which swim around in pairs and the usual reef fishes, Scorpion Fish, Yellow Snapper, Ghost Pipe Fish, Hawksbill Turtles and many large Groupers. Other marine life here includes; Leopard sharks, Black Tip Reef Sharks, Yellow tail Barracuda, Jacks, Tuna, Mackerel feeding on the masses of glass fish, Octopus, Cuttlefish, Seahorses, Ghost Pipe Fish, and hiding on the sand blue spotted stingrays.